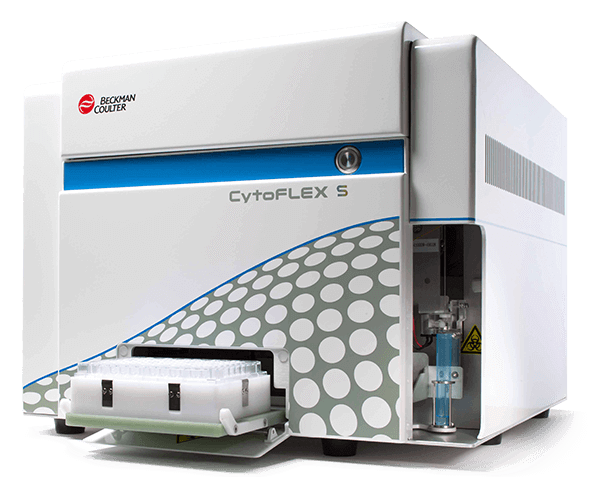 CytoFLEX S V4-B4-R3-I2 Flow Cytometer has 4 active lasers (405 nm, 488 nm, 638 nm, 808 nm) and 13 channels for fluorescence detection. This instrument can be upgraded with a maximum of 4 Violet, 4 Blue, 3 Red and 2 Infrared channels. It includes 13 repositionable bandpass filters, 450/45, 525/40 (2), 585/42, 610/20, 660/10 (2), 690/50, 712/25, 763/43 (2), 840/20, 885/40. The complete system is supplied with computer work station with CytExpert Acquisition software, sheath and waste containers with harness.